time and desire. My design team work comes first, so there will not always be items in my store and when there are, they tend to sell out pretty quickly. I will only send out a newsletter if I have a large inventory to add to my store at once. You can sign up below to receive my newsletter. 1. Do you take orders? No, absolutely not, under any circumstances for any reasons. Please don’t ask, because it makes me feel so bad when I have to say no. 2. Do you do custom work? No again, not for any circumstances or reasons. It is very hard for me to create something someone else envisions, and I end up very unhappy with the process. 3. Do you use molds? No, I use only my hands, a Pasta Machine, and three little needle tools that I created myself. 4. Do you use cookie cutters for your snowflake ornaments. No, I create all of my designs in Illustrator, then cut them out of card stock or plastic and cut around them to create my ornaments. 5. What kind of clay do you use? I use a mixture of Fimo and Premo. These are two of the most durable of the polymer clays available. 6. How long have you been working with clay. About 23 years now. I sold at craft shows around the country for several years, until my kids were born, then it became impossible to create the quantity needed for the shows. I sold on Ebay for several years, then took a pretty long break. Now I only sell in my Etsy Shop. 7. How long does it take you to create an ornament? Well, of course it varies with the details in the ornament, but I would say from conditioning the clay to the final firing, about six hours. They are extremely durable, but yes they can be broken. I have ornaments that I made when I first started working with clay that the kids have hung on the tree for years, they have been dropped as well, and are still in perfect condition. Most often something will just come apart, like an ear or a nose rather than the clay actually breaking. 9. Can I see what you have available ahead of time and just buy some ornaments directly from you? No, I’m sorry. I can’t do this. I have too many people who have been waiting for months to be able to purchase an ornament. 10. Do you ever make the same ornament more than once? Rarely, I don’t enjoy doing the same thing over and over again. I will make Santas, Owls, etc, but they will all be just a little bit different. 11. I got your newsletter and went to your Etsy store, but there was nothing there. Where are all of the ornaments? If you don’t see anything in my store, it means they are all sold out. 12. When will you have more ornaments? Do you have a schedule of when you list them? 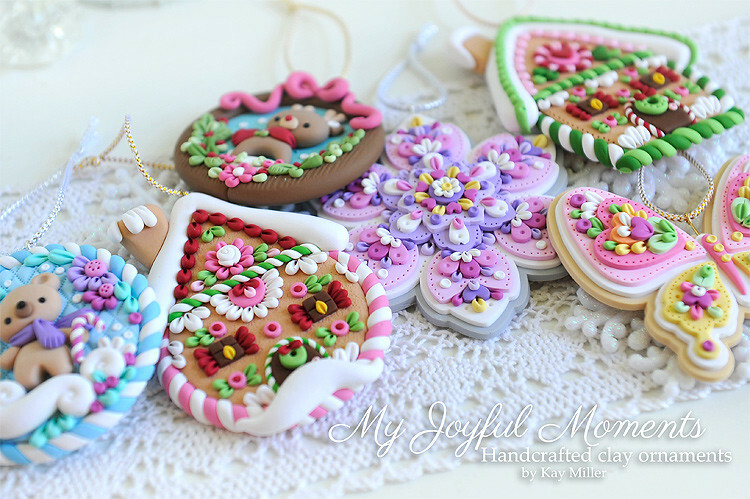 Lately I have been adding my ornaments on Monday mornings at NOON 12:00 PM EASTERN STANDARD TIME. 13. Do you do tutorials or videos? No, I'm sorry, I just don't have the time to create and do videos and tutorials too. 14. Can I create ornaments like yours and sell them?